As worker keris, Djiwo Diharjo ( 71) confess, keris is honour symbol. 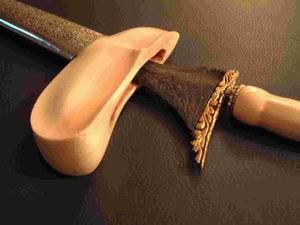 Keris believe public mambawa luck would safety and. So doesn't surprise many key mens as of class Soeharto ( former President RI), Sultan Brunai Darusalam Bolkiah also interest to have keris made in member of this Banyusumurup, Imogiri. For Djiwo x'self, profession as worker keris acted since adolescent age because its(the nenek-moyang is of course a worker keris. Even, according to its(the speech semenjak my Hameng era Buwono V, its(the family becomes customer Kraton Ngayogyakarta Hadiningrat in the case of making keris. 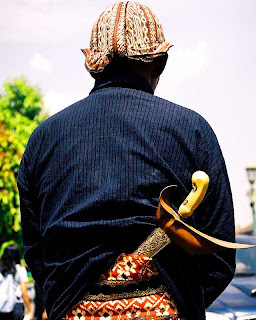 The existing finite also, the side of Kraton Jogja still ordering keris. Makes keris is not lah easy. More than anything else to make keris appearance more authoritatively and has high art is not light work. Djiwo confess, for keris which is cheap with the price of Rp 450000 poisons completed 1 week. But for keris which is expensive which depth is arranged in layers [by] pure gold, butuh time around 6 month of poison completed. “ Because keris which is auriferous in price can be reach 20 million per seed,” adds Djiwo. To make keris has content and authoritative telihat, Djiwo confess must do good fasting of that is at the subscriber and also x'self as maker. But sometime quite a few surrendering bongkohan which is important become. So x'self is not rarely must fast x'self. Till now a lot applies keris for a few requirement. Both for the rank business, career, [position/occupation], finite business of authority the consumer. “ Of course unlimited common people, functionary circle even business also a lot applies keris for safety,” he said. To make Jamas, Warangan, Sediment Glaze etc x'self intentionally chooses choice woods delivered from Temanggung, Wonosobo, ligneous Magelang of Timoho, Nangka, Kemuning etc. Process of depends on price and wood applied. Increasingly expensive, hence wood and making time more and more with quality and height the price because its(the production process is meticulous and precautions. “ Special of order of key man must fast in front before making,' explicitly Djiwo which descendant still of Kyai Empu Panjang Mas from this Majapahit.